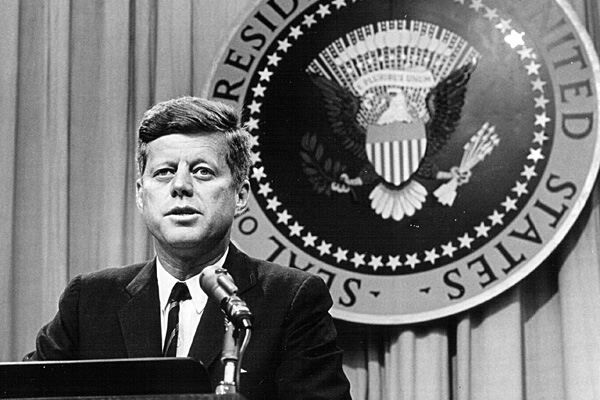 John Kennedy said, "The world is engaged in the most difficult and trying struggle in its long history. All of the great epics which have torn the world for the last 2,000 years pale in comparison to the great ideological gulf which separates us from those who oppose us. It is our responsibility not merely to denounce our enemies and those who make themselves our enemies but to make this system work, to demonstrate what freedom can do, what those who are committed to freedom and the future can do." Even though the circumstances have drastically changed, the challenge is still the same except much more difficult because our government has totally failed us. I simply cannot continue a dialectic that pretends the Republic still stands. Something stands, but it is not America. At its governmental core it has grown decidedly anti-american an enemy to its own people. Now John Kennedy's challenge to stand firm against the Marxists who sought our demise holds meaning he could not have imagined. The Bottom line is - it is not over until the last breath of the last American Patriot. An old friend, sincere and genuine Christian is quite frustrated with me. He has been the victim of every NeoCon politician since Reagan always placing his hopes on the next Trojan Horse to take the White House. Today he finds himself chaffing, depressed and a little angry at my assessment of our present situation (which is a terrible, painful and bleak picture) clinging to hope that the pumpkin that is Mitt Romney is going to suddenly turn into a golden chariot and carry us to Liberty - he said to me, "So, we get back to my original question--aside from sitting on our couches and listening to you, and nodding our heads and feeling bad, what would you have us DO about it? What's your SOLUTION?" Very far question, but in the old dialectic. Instead of continuing in the delusion of the present dialectic, being manipulated into casting your vote for the lesser of two evils, and doing so out of fear, entertain other possibilities. For one TEACH the reality of our founding, and expose the Luciferian forces that are trying to destroy us. We are to a point where we have lost our Republic, - Ben Franklin answered a woman as he exited the Constitutional Convention when she asked, "What have you given us, Sir." He said, "A Republic. If you can keep it." 6-28-12 The Robert's Precedent was the final answer. (we did not keep it - any semblance of "constitutional" liberty where upon our Republic was formed is finished, null and void). And I did not say this to him, since it is a subject he knows well; we need to get our hearts right with the Lord, along with our American History we need to reclaim NOT our Christian History, but the REAL PRESENCE of Christ - the power and force that conquered the Roman Empire in three hundred years without an army. We need to take the restraints from our hearts and from our lips and start testifying to the reality of HE who is Truth, Life and The Way. We will not find The Way, without this. And in it all, we must do all that we can do prayerfully, and act then in wisdom - hopefully greater than our fears.